Visit our Ruby Lane shop for a great selection of vintage costume jewelry and accessories. This site is an excellent source of information about vintage costume jewelry companies, designers and manufacturers. There are also extensive photos of identifying marks. The Jewelry Ring is an active online group serving the vintage and collectible jewelry community. Membership is by invitation only. 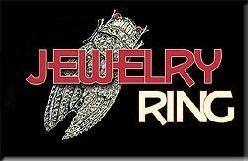 Visit THE JEWELRY RING MALL for a fabulous selection of vintage and collectible jewelry. If you have a serious interest in vintage costume jewelry, you'll want to become a member of Jewel Collect! Are you in search of shiny sterling, nifty novelty necklaces, funky floral pins, bodacious boho bangles, or dazzling designer pieces? Then check out our large selection of new, vintage, and some never worn jewelry. You�re sure to find something just right for you! Amazing Adornments vintage, antique, newer costume and collectable jewelry including vintage sterling silver, Mexican, Scandinavian, Native American sterling plus artisan sterling and Swarovski crystal jewelry. We keep our prices low so you can always wear something amazing! Featuring vintage signed and unsigned costume jewelry from designers Miriam Haskell, DeMario, Hobe, Trifari, Coro, Monet, Weiss, Juliana and Eisenberg. You will find brooches, necklaces, demis, parures, earrings and bracelets. Beautiful, affordable vintage and antique costume jewelry from Victorian to Art Deco, 1930s, 1940s Retro Modern, 1950s, 1960s, 1970s, 1980s. Come have some eye candy. Quality Vintage Jewelry Never Goes Out of Vogue~It's the design elements I look for~Signed or unsigned, it matters most in the design & Construction~That's when you know you have a phenomenal designer piece! Satisfaction Guaranteed. Antique Jewelry, Vintage Jewelry & Gianna's Gems. We specialize in one-of-a-kind antique jewelry and vintage jewelry. Come share the passion! Gems added weekly. Vintage costume jewelry from the Victorian Age to the Space Age. Items for every taste and budget. Mid-20th century rhinestone pieces are our specialty. A large selection of vintage, fine and retro costume jewelry. We also offer many wonderful fine antiques and collectibles. Vintage Costume Jewelry, Accessories and Collectibles - Something Special for Every Taste & Budget Featuring Vintage costume Jewelry, Designer Signed and Unsigned Necklaces, Brooches, Earrings, Bracelets, Sets & Parures. Designer jewelry by Bogoff, Har, Mazer, Juliana and much more! Your Satisfaction Guaranteed. Quality handcrafted signed 'one of a kind' jewelry, vintage jewelry, antiques and collectibles. Warning - Vintage Costume Jewelry can become addicting!! Stop by for beautiful vintage signed & unsigned jewelry! Vintage jewelry specializing in Cameos, Czech glass beads, Italian, Scandinavian and American Sterling, and Egyptian Revival cameo stones, offering high quality with low pricing. Specializing in fine antique jewelry and vintage watches with an emphasis on the Victorian, Edwardian, Art Deco and Art Nouveau eras. Featuring a wonderful selection of designer-signed and unsigned vinatage costume jewelry and accessories. Vintage Costume Jewelry, Cameo Jewelry, Christmas Tree Pins, Damascene Jewelry, Sarah Coventry Jewelry and much more. Where Timeless Magic of Yesteryear are the Treasures of Today!! Featuring signed and unsigned upper end vintage jewelry at low end pricing including Hobe, Trifari, Eisenberg, D & E, Juliana, Coro, and more.